The shop is open 7 days a week with a fine selection of foods, local produce, wine, spirits and newspapers, as well as a range of stationery and your local Post Office. Hambledon Village Shop overlooks the cricket green, within walking distance of most of the village, but with plenty of parking for customers who come from further afield and providing a really friendly service from local volunteer staff. We offer a range of groceries, including local fresh fruit, vegetables and meat. The delicatessen counter offers home made pates, such as smoked salmon and chicken liver with brandy, as well as cheeses, cooked meats and olives. There’s additive free bread made from local flours delivered fresh, and a great selection of home-made cakes, biscuits, drinks and confectionary. We bake baguettes, sausage rolls, a variety of pies and vegetarian pasties on the premises. Or come in and order a freshly made sandwich. Try out our new chilled wine selection, a good range of quality reds and a locally produced sparkly wine, as well as beer and spirits. There is a wine list available and discounts on purchases of 6 or more bottles. Pick up your daily newspapers, which can be ordered to guarantee your copy, or come and browse through our selection of gift cards and wrapping paper. Convenient for dropping off your dry cleaning and laundry. Remember – stop by on a Sunday morning to collect your croissants, pain au chocolat or Danish pastry, as well as your newspaper, for a breakfast treat. 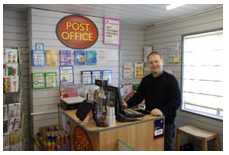 There are all the usual Post Office services including insurance, giro and phone cards, as well as paying your bills. Plus get your currency here – commission free. The shop is also a stopping point for the mobile library, alternate Thursdays.